Millions of people suffer from hair loss or thinning. Men and women alike can be affected by this which can cause anxiety and loss of confidence. Through the years there have been several over the counter supplements and topical ointments introduced claiming hair growth. However, the vast majority of these did not produce desired results. Now there is a medical breakthrough to stimulate hair growth without surgery. Platelet Rich Plasma (aka PRP) has been utilized in many medical treatments for the past several years. PRP is a technology that spins your own blood separating the rich platelets and reinjecting them into the body and has shown positive results. Selphyl®, the makers of the centrifuge that processes the blood, has taken it one step further by taking the platelets and plasma and adding a small amount of calcium chloride which builds the Fibrin Polymerization or matrix. This matrix serves to protect the platelets so the release of the growth factor can be sustained over a longer period of time. This technology is also a closed system and does not require operator assistance. This helps eliminate contamination. The entire procedure takes about 30 minutes and is performed in our medical office. There is no downtime and you can return to normal activity immediately. 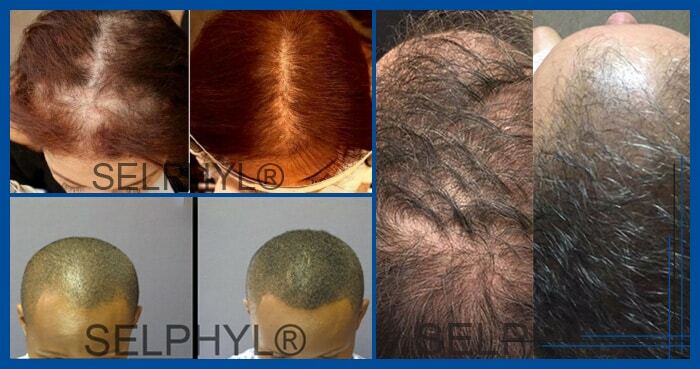 The treatment is a series of injections into the area of the scalp suffering from hair loss. It is important to note that some hair follicles need to still be present for the PRFM to be effective. If the area is completely void of hair this procedure will not stimulate growth. Therefore, the sooner you notice thinning hair the better to receive this treatment. Once the blood is processed the rich gold colored platelets that are separated through the process are loaded into a syringe and injected. The size of the area determines the number of injections (example: a 2”to 3” area will take approximately 9 to 10 injections). As with an injection there is slight discomfort. Anesthetic cream is available. The number of treatments needed depends on each individual’s hair loss, desired outcome and the treatment plan. Most patients require 3 treatments spaced 4 to 6 weeks apart for optimal results. There have been no known side effect associated with PRFM to date. As with any injection, some patients may experience some mild to temporary irritation, swelling, redness or bruising at the injection site. As an aesthetic practice we understand the emotional stress that can occur with hair loss. Our goal is to help you gain confidence. Suffering from Hair Loss? There is Hope!